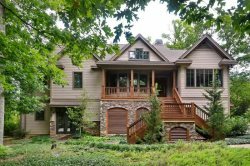 The Cliffs at Keowee Springs provides a spectacular collection of homes. Here on the shores of Lake Keowee, within this unparalleled wellness community, an incredible collection of Residences provide the ideal place to begin, or continue, your journey to change your family's life for good. The beautiful surroundings provide an endless array of activities and amenities including a Tom Fazio-designed golf course, The Springs Beach Club and the PGA Tour Academy at The Cliffs at Keowee.